I promised back in 2012 to tell you about the 50-hour science fiction marathon. As we just passed the 40th anniversary of the event, I think the time has come. For more than two days in March, 1957 1975, I sat with hundreds of other crazy people and watched 25 feature motion pictures starring aliens, monsters, robots, and screaming women. And it wasn’t just features. We were also treated to shorts (Trip to the Moon, Duck Dodgers, and so on), trailers for features they weren’t showing, and the complete, original, 13-chapter Flash Gordon serial from 1936. It was all part of Filmex, the Los Angeles film festival that launched in 1971 and lasted through 1983. In ’75, Filmex moved from Hollywood to the Plitt Theaters in Century City. It was a duplex back then, and most of the marathon was in the huge theater with the curved screen. This was two years before Star Wars made sci-fi big at the box office. Very few science fiction movies were made before 1950. The 50s and early 60s saw a lot of cheap, usually bad sci-fi inspired by the atom bomb, the cold war, and the space race. Then, in 1968, Stanley Kubrick blew the lid off the genre with 2001: A Space Odyssey. Suddenly, science fiction became artistically respectable. And the marathon came only seven years after that change. Something else to remember: There was no home video in those days. If you wanted to see a particular old movie, you had to wait until it played at a local revival house, or caught it–cut up and broken with commercials–on broadcast TV. The festival oversold tickets, so the marathon started badly. They separated ticketholders into two lines, based on where they bought the tickets. One group, the smaller one, would be allowed in before the other. The larger line, which I was in, got very angry. Amongst the very angry sci-fi fans was at least one lawyer, who started collecting names and phone numbers for a lawsuit. In the end, the festival let everyone in at the same time. I came in knowing that I couldn’t sit in a chair, awake, for 50 hours. So I set for myself a more practical goal. Since Flash Gordon were spread across the entire 50 hours (roughly a ten-minute chapter before every second feature), I would try to catch each one. I succeeded. The serials of the 30s and 40s, designed to keep young children returning to the same theater every week, are almost all laughably bad. This is the only serial I’ve watched theatrically in its entirety . Believe me; it was the perfect audience. 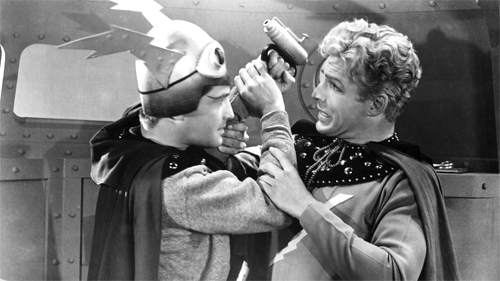 Although I woke up for each Flash Gordon entry, I couldn’t stay awake through all of the features. I very much wanted to see the original Invasion of the Body Snatchers, which I knew by reputation but hadn’t yet seen, but I slept right through it. (Ironic for a movie that was almost called Sleep No More.) On the other hand, I succeeded, intentionally, in sleeping through THX-1138. I spent some time in lobby, talking with people and looking at the displays. That’s where I talked to Ray Bradbury–not for the first time. I only left the theater once, to take a walk and buy some food at a supermarket. I don’t remember what movie I missed, but I’m pretty sure it was one I wanted to miss. A Boy and His Dog: The festival opened with this film’s world premiere. I found it creepy and disturbing, and I liked it. 20,000 Leagues Under the Sea: The Disney version, in a beautiful Cinemascope print. Oddly, the scene that sticks most strongly in my mind is a ridiculous musical number. 2001: A Space Odyssey: They screened my then-favorite film in 70mm on their huge, curved screen. As of today, it’s the last time I’ve seen it that way, which is how it was meant to be seen. If I recall correctly, the film’s intermission was the only intermission in the whole marathon. War of the World: They screened a beautiful print of this late three-strip Technicolor movie. I suspect it was an archival, dye-transfer print. 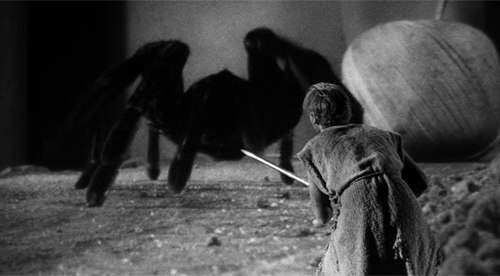 The Incredible Shrinking Man: I hadn’t seen this one before, and I wasn’t particularly interested in it. But it blew me away. Wonderful movie. The Day the Earth Stood Still: The marathon closed, after Flash Gordon’s happy ending, with this 1951 message movie. Other films screened included The Bed-Sitting Room, The Thing from Another World, Forbidden Planet, Metropolis (a much shorter version than we have today, and with a canned musical track), and This Island Earth. According to Wikipedia, other films screened there included The Mysterious Island, Solaris, The Illustrated Man, and Silent Running, but I have no memory of them at the marathon. By the way, I went to more than just the marathon that year. Also at that festival, I caught the world premiere of Monty Python and the Holy Grail. I’ve been a fan ever since. That was the last Filmex I ever attended. Two months later, I was no longer a Los Angeles resident. Two years later, without my attendance, they ran a 50-hour musical marathon. March 30: I’ve corrected a typo. Thanks to Lea D. for bringing it to my attention. HOLY COW. Ok, you are officially a geek! Actually, I’m sure this was very fun. Hope they at least fed you something! No, they didn’t feed us. But the concession stand had some reasonably healthy sandwiches. Very interesting story. I think there’s a typo in the date in the second paragraph … you don’t mean 1957, do you? That would not fit with the rest of what you wrote. Sounds like quite an experience. Thanks for catching my error. I’ve corrected it.